Anyone who has had a salted caramel in their life knows that such a simple combination of sugar and salt can be a decadent and indulgent experience. Add a touch of chocolate and the result is elevated. 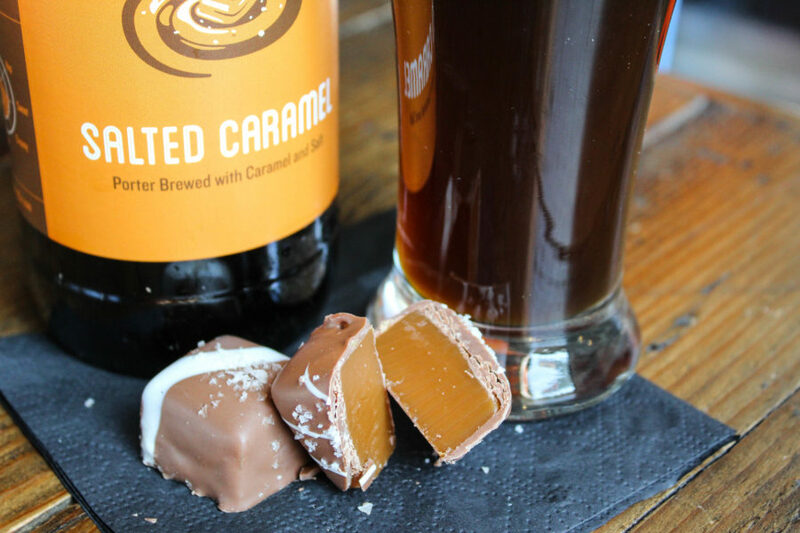 The essence of this confectionary treat is what we attempt to capture in our seasonal release of the Salted Caramel Porter. 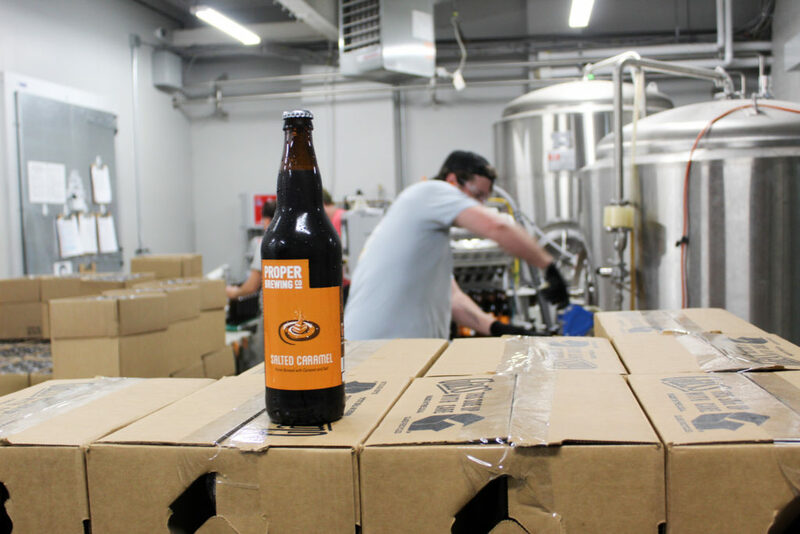 Here at Proper Brewing Company, we constantly strive to procure high quality ingredients to make the best beer we can. There is no exception with this beer, as our process of brewing this porter includes making our own house caramel as well. It is a simple process, but one that takes patience and time to accomplish. Having the right tools and knowledge doesn’t hurt either. 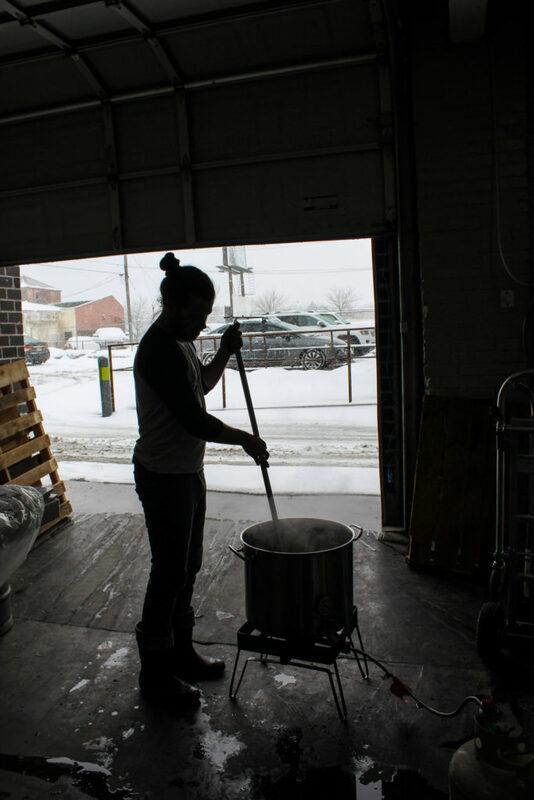 It is pretty awesome that on top of all of the creativity and experimentation we practice in brewing, we can hone skills like that of candy making. Making our caramel just right is key to producing this fan favorite beer, and we’re proud to share it with you. On brew day, aside from the regular tasks of running the brew house, one of our brewers must monitor a second, smaller set of equipment. To start, we have small home-brew propane burner, along with a 20 gallon stainless kettle. We begin by measuring out 30 pounds of sugar, split between regular white table sugar and lactose (for depth of flavor). This is then mixed with a volume of water to dilute the sugar into a solution. Once all of the clumps have dissolved, the heat is turned on, and the process is on its way. 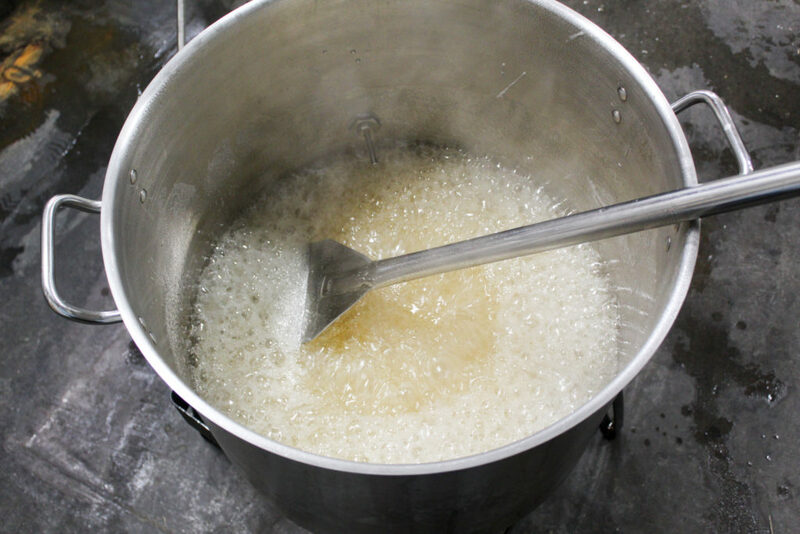 Initially, the amount of water in the slurry is too much for any real caramelization to occur, so the first hour or so is spent slowly stirring the pot and allowing the liquid to evenly heat up to its boiling point and then evaporate off. 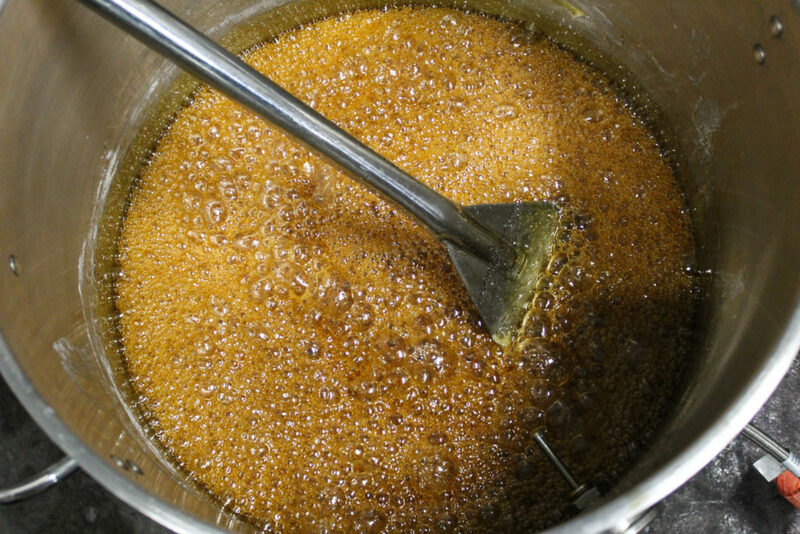 Once a majority of the water has volatilized, the sugar slurry starts to turn a soft golden color as the hot metal begins the caramelization process. 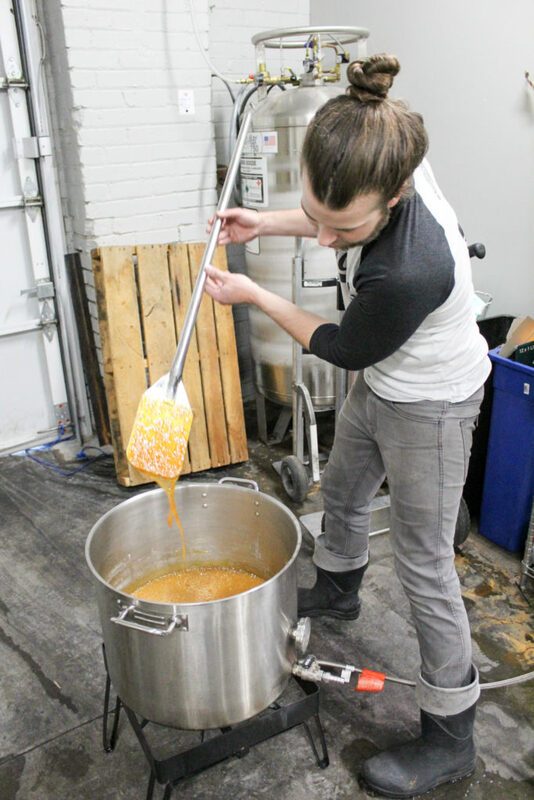 The emulsion churns and bubbles and turns itself over in the kettle, with some gentle stirring, all of the sugar comes in contact with enough heat that it eventually darkens further, from milky white to pale gold, to amber, into a gentle reddish-orange. This whole time, we are monitoring the temperature with a infrared probe. 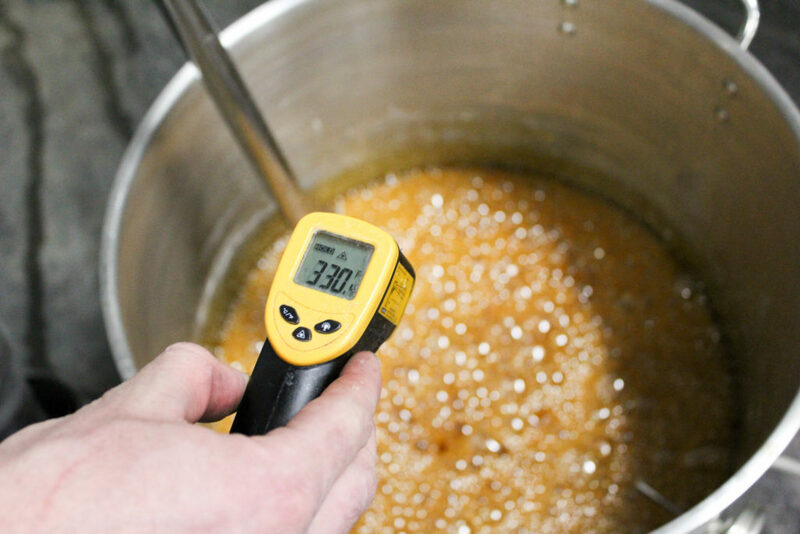 The ideal temperature range for our caramel is to reach between 290-310 degrees Fahrenheit. Generally, we halt the process at this temperature, but it becomes visually apparent earlier that the caramel has reached a point just shy of “hard crack” due to the color change. At this point, the caramelization process is complete. We turn off the heat and allow the entire concoction to rest for a few minutes. At this juncture, we have to dilute the caramel back into a liquid so we can incorporate it into the wort boiling in the brew kettle. We carefully add water to it—the reason being that 300 degree caramel will cause the cooler water to immediately hyper boil and sputter and pop everywhere. Care and protection are crucial at this and all stages. With the water added back, we return it to the heat and gently stir again until the caramel has fully dissolved into a much thinner form, but still with all of that dark, burnt sugar goodness contained within. At this point, it is ready to transfer over into the main brew kettle and incorporate it with the rest of the wort, just before the end of the boil. After this, the wort is chilled, fermented, packaged and presented to all of you eager and willing consumers. We appreciate your love for this beer and we enjoy the process of making it and offering it to you all. Cheers!